The work to widen the North Western motorway is becoming ever more prominent – and soon requiring the closure of the bus lanes. So I thought I would look for some old photos from when it was under construction to help show how much the area has changed in the just over 60 years since it was built. Back in 1949 Auckland was a very different place. For a start there were no motorways and we had trams rolling around most of the isthmus which was where most of urban development was focused. The land on the Avondale and Te Atatu Peninsulas was used for farming and of course the North Western motorway didn’t exist. One of the key reasons for building the motorway was apparently to provide better access to the airport – which at the time was at Whenuapai. This was also to be the main route north out of Auckland and it was only after the harbour bridge opened that plans to run the main highway north cutting through the central city emerged. By late 1951 construction would be well under-way. In the two images below you can see the causeway extending out into the harbour. By late 1955 you can see the Te Atatu Rd interchange starting to emerge. On the city side, the motorway ended at Pt Chevalier where it joined Gt North Rd. It wasn’t extended to the city till the 1970’s when the CMJ was built. Since opening the motorway has been widened and added to numerous times. It started out as a four lane motorway and by the time the current upgrade is finished, some parts will be up to 11 lanes wide when you include the bus lanes. I hate motorways wider than two lanes each way – they are truly traffic sewers! I really hate Railway lines with more than a single track as they end up carrying lots of people! There is a clear difference there. What would you prefer a six lane motorway or a single rail track. They both have similar capacity. In the UK I used to live a similar distance to the A5 dual carriageway and the WCML. I never heard traffic on the expressway. The rail line was elevated in order to maintain the required grades and the Intercity 125s were really loud, especially at night when the background noise was lower. So I’d rather live near the motorway. I this three lanes each way is about ideal, more than that an you start getting big inefficiencies around weaving and lane changes that offset the additional lane capacity, not to mention the space gobbling. Haha that’s an awesome response to a moronic comment above! Actually, the motorway still stopped at Pt Chev until the mid-80s. The CMJ leg only went as far as MOTAT as late as 1983, so Great North Road from Western Springs to Pt Chev was still SH16 at that stage. The last step required cutting through the Sutherland estate / golf course. The entire area was so much nicer before the motorway was put in. The pictures confirm it. Agree, even though I wasn’t here then, in particular I live the grand entrance to what is now Unitec, such a shame that was lost. 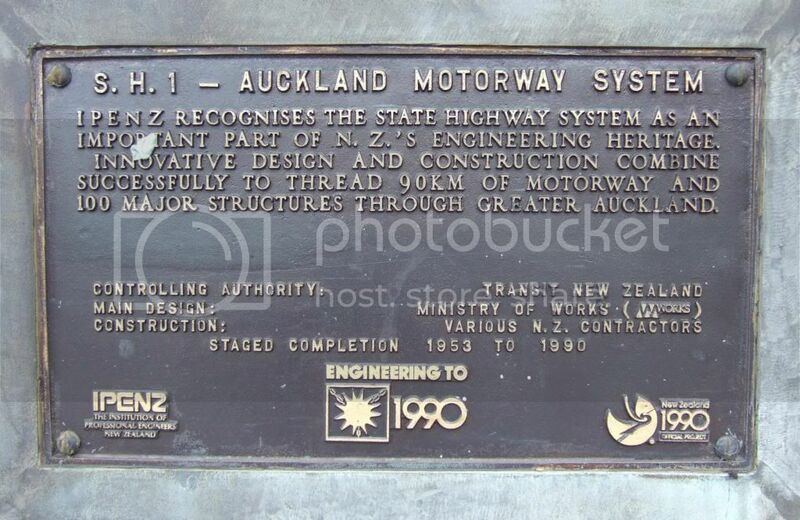 I wish we had stopped building and expanding these motorways in 1990 like the plaque states, would have saved a vast amount of money that could have been spent on improving the Auckland urban place rather than actively destroying it. The expansion of the Northwestern yet again and the ‘massification’ of all the onramps such as Western Springs (along with all the trees in the are being cut down to add in extra lanes on Great North Rd) is further testament to the folly. Great North Rd should be getting turned over to public transport, walking and cycling with the motorway next door. Instead it is being usurped and turned into simply an increasingly unpleasent feeder onto the evergrowing Northwestern. bbc agree entirely. If we had followed the overall recommendations there would be another plaque after a completed PT network. What is done is done . But how we go from here to retrieve the situation puts the emphasis on us to put things right. Step 1 -reprioritisation acknowledging what modes should have priority in the network and future spending. We aren’t even at this point yet? although feel we are about to be. They should have stopped when the motorway was at Great north Rd and swapped to building the bypass of the city instead of ramming it through town. There is a mass grave up on Symonds at where they dumped all the remains they dug up to put the motorway through. I wonder if we are the only city in the world with mass graves attributable to highway building? Wellington has a similar mass grave from when the motorway was built through Bolton Street cemetery. I think it was a very short and bizarre period in history when people would have considered disturbing the remains of the dead like that. As an aside, Ancient Rome actually forbade burying people within city limits, exactly so that the city wouldn’t end up with sites that could never be redeveloped later! Now now. IPENZ Auckland Branch is strongly in favour of the CRL. David Wilmott is one of few exceptions. I wonder if he is related to the Wilmott’s of Wilmott Toyota, might be a conflict of interests? Wilmot Toyota’s managing director is David Wilmot (one T). David Willmott” of Roads First has two Ts in his name. Looking over his CV I see he has graced Auckland with the widening of St Lukes/Balmoral/Greenlane Rd (ugh, presumably with that open-and-merge-again straight-thru left lanes that are only really used by lane cheats) and design work on the thankfully never-built SE Motorway through Hobson Bay. 1) The Chinese proverb never said anything about filling those roads up with cars. 2) Google the phrase. As at time of writing, Result #1 is Wilmott’s site. Result 2 however is gold. Gold indeed and it might explain one of the reasons why the Hon Steven Joyce is no longer so enthralled by his former bff PLA capitalists. I gather he’s now decided that the Japanese are the ones he wants to cuddle up to and we all know the Japanese are deeply fond of trains, especially if they’re fast. Time for a U-turn? Googled expecting to giggle, was not disappointed. Why is he campaigning on that platform, it seems self defeating, we have already built the roads so surely we need that proverbs second recommendation? We share the distinction of having mass graves attributable to highway building with Wellington where they dug up most of the Bolton Street Cemetery for the Wellington Urban Highway. Another great example of New Zealand’s engineering heritage. While it is sad, small things like that shouldn’t be a reason to stop projects. After all isn’t the CRL going to disturb the taniwha. Mind you, hardly a reason to stop that project. The destruction of cemeteries is, indeed, a ‘small’ thing in the scheme of things, but it’s symbolic of far more devastating impact that these ill-conceived projects have had on the environment, on communities and society at large. And what might be ‘small’ to you may be big to others: a couple of my ancestors were buried in the Bolton St cemetery in the 1860s and were disinterred; thankfully, those in the Symonds Street cemetery, buried between 1847 and 1879, were located outside the scope of the project. What prompted New Zealand to build motorways in the first place? I had always assumed it was to follow the precedent set by the UK but your photos show that construction was underway before these types of road were being built in England. The Preston bypass ( the first of it’s kind in England) was not opened until 1958. Surely late 1940s Auckland could not have had traffic volumes (either existing or projected) greater than those in the UK at that time? It’s probably important to realise the first motorways weren’t supposed to be urban freeways for suburban dwellers to drive to work on, they were more or less rural highways for intercity and regional traffic. The first we built were replacements for the great north rd (northwestern out round the upper harbour toward northland) and the great south rd (the southern from Ellerslie to Papakura town). Like Matt says at the time they were rural highways passing through farmland. It was only in the fifties when the decision was made to co opt them to serve urban commuter transport and facilitate suburban expansion, all part of the postwar economic miracle dream of universal automobility. It’s only taken us fifty years of furiously following that dream to realise it’s ephemeral. My mum talks about visiting Auckland as a girl in the 1940s. The population of Auckland then must have been around 200-250k people. She says the trip through the suburbs took forever. Motorways have allowed Auckland to grow from a town not much bigger than current-day Hamilton to a huge city of 1.5million people, without a trip from the Bombays to the North Shore taking four or five hours. Including the Harbour Bridge, I doubt if any infrastructure project in NZ has been as successful or delivered as many economic benefits. Shame they didn’t stick with the original plan of having the motorway bypass downtown then, it would have been even easier to drive from the Bombays to the north shore without having to go through Spaghetti Junction. Pretty sure the scheme of directing all the motorways into the single,ost congested spot possible wasn’t spectacular in terms of economic benefits, in fact I would call it a complete balls up. The practices overseas are to either force motorways through the center of a city, which is usual in the US. Or to bypass a city, which is often done in Europe partly to avoid a historic city center. Auckland has limited options in that there isn’t a bypass route available. Would Auckland have been better if the motorway network had passed by the CBD at some distance? Possibly, although the need to access the port would probably have necessitated a spur in to the vicinity of the CBD any way. The Spag Jn layout is a mess due to the closely space junctions; the encouragement to weave; and the funneling of two motorways in to one with a split to two again a couple of kilometers away. I’d love to close the under-performing port, and then close the Grafton spur to tidy up the topology a bit. However, this mess hasn’t stopped Auckland growing from 300k people pre-motorway to 1.5million now. Whereas Wellington has had a relatively modest population increase while relying heavily on commuter rail. Of course you totally ignore the alternate-universe city in which we spent, say HALF that motorway money – on constantly upgrading, modernising and maintaing our tram / light rail network, and got a similar or better growth, and a more successful city without poisoning ourselves, or cutting apart our city into isolated pieces. With the rest, we could have built maybe a single motorway north-south through the whole lot, 2-3 lanes max, and would have been big & liveable all together. What Max, you mean like an alternate reality such as Melbourne that grew by two million residents between 1950 and 1990 despite having less motorways than Auckland, none connected to another, and none that came into the CBD? Instead they upgraded arterial roads in the fifties and sixties, maintained and modernised their trams in the seventies and built the city loop rail tunnel in the early eighties to turn their legacy rail lines into a true commuter system. At the same time they ended all their motorways at least 6km from downtown, incidentally this is about the same distances as water view and ellerslie to our CBD, where the motorways initially stopped. Yes it’s true they widened and boulevard-ised some of the roads between the motorways and CBD, although we also widened Great South and Great North, but poorly in comparison (maybe because we focuses all the money and traffic on to the motorways?). But they resisted their plans to level the inner city to build commuter motorways, and didn’t actually join them up until the late 90s, even then staying well clear of the CBD and using tunnels for the most part. Where would we be today if, since the late seventies, we’d had boulevards in great north and great south, a ring road motorway around the west, an intact rail network, city rail loop, and the suburbs of Newton, Grafton, Arch Hill and Freemans bay intact and thriving like ponsonby and Parnell? I’m not anti-motorway, it was after world war II when cars were affordable and the motorways were originally planned as direct access roads to Auckland. In those days, Europe, USA and Australia were building motorways and they had the same idea, build direct access roads to the city. To be honest, motorways do cause negative effects like traffic congestion and urban sprawl, even with excellent public transport, there will still be congestion on the motorways. aesthetic disaster perhaps but that is purely subjective. The Eiffel tower was considered a monstrosity for decades. environmental disaster maybe, but no worse than many hydro dams or mining projects, or the asbestos laden buildings of the same era. social disaster, no way. the benefits to society far outweigh the negatives. The Auckland motorway is truly an engineering masterpiece in its scale both in size and benefit to society, but still comes a distant 2nd to the national electricity network. Pity we went overboard on roads and forgot about our rail network entirely. Only one of those photos actually shows what it looked like before the motorway, all the others have the motorway right through the middle of the photo showing what it Auckland used to look like with the motorway. Yes. A mix of rural land and low density (quarter acre?) suburbs. If you like that sort of thing (like the commenter who said it was a lot nicer pre-motorway) then there are plenty of towns in NZ where you can still enjoy it. Like Whakatane or Wanganui. Because density can only be achieved via motorways, huh? Nice straw man attack – and nicely combined with the “If you don’t like it, why don’t you leave?” attack. Which wasn’t even slightly the point I was making. If you look at a photo of ancient Auckland that is half farmland and opine that Auckland was better back then, then modern Auckland isn’t the place for you. Unless you can describe a city of 1.5million people that is still mostly open farmland. Thanks for putting these pics up Matt – it’s so easy to be focused on pushing for a better future that we often forget to look back. To be honest, the thing that hit me between eyes seeng these pics again, now, was not a motorway thing but an observation in the context of all those Auckland 2040 types who want to want to ‘preserve’ their suburban paradise. They seem to forget the change that was wrought to bring their beloved quarter acres into existence, seem to forget how short a time ago the things that they regard as permanent ‘normality’ were the dream of a bureaucrat, a planner. What short memories we tend to have. Change is normal. It’s how we deal with that change that matters. The northwestern opened a year before the southern, great north rd to Te Atatu. Lincoln Rd came a couple of years later. It was complete to Hobsonville Rd by 1961. The fact all neo-liberal parties are signing from the same hymn sheet, just goes to show that this is really an ideological discussion not an evidence based one. The State neo-liberal parties in Australia are much more pro-PT than their Federal counterparts. I can see Tony Abbot’s justification for not funding PT from Federal coffers at a time of tight budgets. However the logic fails when he can find funds to support urban motorways, and has a preference for them to be free. The reason the traffic on Sydney’s northern orbital was light at peak hour is because of tolls, costing $18/day + parking to commute from the north-west to the CBD. It is the tolls that keep the road from becoming congested, so it is available for freight and VIP’s. Yes absolutely on the State/Federal divide. Much like the Council/Central divide in NZ where Council’s are keen to spend money on PT/active modes but Central is just focussed on roads. It must mean something when the Council people on the ground in the cities (who are looking their constituents in the eye everyday and actually have to commute everyday) want one thing and the Central government people (who spend their day making animal noises at each other in Parliament and scoring cheap political points) want something completely different. Auckland needs to give one existing lane to PT/Freight everywhere especially on the north western and adjoining arterails where currently pressurised to the max. I fear all this widening is just an eye sore and money down the drain and not helping in the slightest. It may get you to the next traffic jam slightly faster for a while but a long term fix …no. Havn’t we learnt our lesson yet? We need to invest purely in the fix and try and panel beat /maximise the best of the road we do have. We have to fire up a complete PT network all at one time to take the pressure of the existing network so we can invest purely on the fix (PT) over the next 17 years and not the band aids on the current haemorraging. Well said. Totally agree. It is now a known fact that increasing roading capacity is a temporary solution at best. So why do we keep on doing it? Motorway capacity improvements in particular seem to generate demand for ever increasing local roading ‘solutions’ even when the case for change was based on the argent that it would relieve pressure on llocal roads. WRR case in point. Now look at proposals for GreAt north road interchange! riafing network just keeps getting bigger and bigger …. was an old lady who swallowed a fly. When will we learn? The westbound Henderson Creek bridge has 1955 cast into it, the eastbound has 1961. I would like to see pictures of the Newton end of the GW motorway before and during construction. for “whites aviation newton” to find the archived aerial photos from the extensive Whites Aviation collection of Newton gully, before, during and after Motorway building. These are high resolution B&W photos, that can be viewed online as small images, and viewed in high resolution online as well in your web browser..
What an amazing collection Greg. Thanks! Just to clarify, to see the high resolution images, click on the link on the page for each photo the link is labelled “See original record”, then when that page comes up, click on the “View archived copy online” link. This brings up in a web browser, the online viewer for the phot, use the “+” and “-” buttons on the page to zoom into the image and pan around as needed. The details you can see if high if you zoom into the highest level. Patrick, this one, shows the view from above K’Rd looking over the same area, from the “top” of the left picture. It was taken in 1966, the Southern Motorway has just started to touch Grafton Gully but no more, so this is as close as you can get to the “original” K’Rd area pre-Motorway as you can probably get. The mid upper right of the photo also shows the Dominion Road flyover and Dominion Road extension being built as well. To comply with the requirements for publication, it must be noted that this image is from the “Whites Aviation Collection, Alexander Turnbull Library”. Looking at those Newton photos from the 60’s & 70s you see what a huge f**king mess they made. And how proud I bet all those “civic leaders” and Government politicians of day no doubt thought how proud it was that Auckland was growing up going to get its own motorway. Like some 21 year old, about to get the front door key! Yeah, what a sad day that was when some Ministry of Works clown in Wellington decided to build an open cast mine for a motorway junction.